So it has been a long time since my last post. I have enjoyed another great summer filled with camps, AAU tournaments, team camps, and some rest and relaxation on the beach. Now that summer is coming to an end, I will begin to post on a more regular basis. Below is an article written by Mike Procopio that discusses coaching great players. Enjoy! Great players in our sport don’t come a long very often. I’m not talking about a player that can be an all star level player, but a player that changes the game and is a franchise player that transcends greatness. We look at them and have different takes on how if given the opportunity would coach and handle them. Many coaches will never have the opportunity to coach a great player in our careers. Some that are given the opportunity sometimes take on the responsibility and the player benefits, and some don’t handle it correctly and the player as well as the program suffers. Coaching a great young player at any level is like raising in a child where they need to be nurtured and guided to maximize their potential. Some people think the LeBron’s, Kobe’s and Durant’s just became great with their natural gifts. Great players are made for the most part and not just born that way. Yes they tend to have God given ability, but that ability as well as their mental toughness were developed over a period of time. Having had the opportunity to work closely with some of the game’s greatest players I have a strong opinion on how I would develop a great player in their early stages. The only way this will get done is if you deal with it head on. There is no instruction manual that you can follow as every player is wired differently. Most of what makes a great player is developed off of the court than on it. Anyone can be great on the court, but developing a player off the court is three times as important as developing them on it. So many players get caught in the nothingness because they are not socially developed properly off of the court. Drills are important when developing players, but great habits and attitude off of the court trumps it. Here are some things that I think coaches should concentrate on. You can’t expect great players while they are young to dominate right off the bat. Developing them is a long journey filled with peaks and valleys. Your entire staff as well as the player need to dig your heels in the ground and expect a long fight. Don’t make the mistake of expecting young players to be physically and mentally dominant on a daily basis. Continue to be positive and communicate to them their mistakes as well as what steps need to be taken to correct them. They need to know that you have their back and will continue to encourage them and have their back. Talk to your player and let them know that they need to be patient that if they take the right steps they will benefit greatly from it. Patience on the coaching and playing side is a very difficult trait to acquire. 2.) The Development of a great player will mostly consist of off the court development than on. From what I’ve seen in my career is that most great players can adjust in time. They make take more time than others to mature into the great player that they will become, but as far as the on court basketball side of it they eventually get it. A lot of coaches that work with players feel as though the more on the court work that they do with players the more that the player will develop. I think most players don’t make it to their potential because of off the court issues. They are uncoachable, players hate playing with them, off the court legal drama, bad work ethic, etc. Things come easy for great players, and with that they obtain a false sense of how good they are as well as how much work needs to go into it. Coaches must constantly communicate and meet with players to put out fires and keep the player on track. Easier said than done, but never take for granted the relationship that you can have with your players as well as their confidence and psyche when you put the time in with them off the court as well as on. 3.) Great players need to lead by example. Not every great player is a verbal leader and that should be understood. Some are just not wired for being verbal leaders and coaches on the floor. But what they need to be are leaders by the example that they show. Great players come to practice early as well as stay late to get their work in. They not only want to develop their own game, but also set the tone for the rest of the team that not only the team’s best player but the league’s best player is putting in extra work to push themselves to be great. If you look at the Spurs and how Tim Duncan works so hard not only in games, but in practice as well trickles down to rest of the roster. What this does is it picks up the rest of the players on the roster to bring their game and work ethic to the highest level possible. I think there is an abundance of players that can dominate in games , but not many can dominate in games as well as put the extra work in as well as bring it every day in practice. I think the selective few that can do that not only bring their own games to other levels, but do the same for their respective teams. 4.) Keep them to the same standards off the court and in practice. The worst thing you can do with any player is to hold them to different standards as the rest of your team. It not only creates bad habits for the player that you are favoriting, but you are creating a very unhealthy environment for your team. There are countless examples of players that developed big egos and never lived up to their potential, because they were always held to a different set of rules and standards of everyone else. Things like being on time for practice/games/team functions, respect to others, good practice habits, etc are things that have to be non negotiable. Great players have to be given bigger leashes on the court as far as their shot selection and ability to play through mistakes. I think the only way great players will learn is to give them big stretches on the floor where they can play through droughts and mistakes. On the court is the separation between average players and very good/great players. Off the court they are held to the same standards, on it they are given more freedom. Great players will make mistakes in their early phases of development and I think its important to let them play through it to a certain point. Players lose confidence quickly when they are yanked for every mistake. It is better to get film of the game and go over it with them in film sessions rather than just take them out after every mistake because that will cause them to be afraid of making mistakes. You cant be afraid to suspend your best player. The rest of the team needs to now that talent doesn’t give players the authority to play by another set of rules as far as conduct, respect, being on time etc. They need to know that you have total control of the situation. Having control of your ship is very important and can’t be taken for granted. If your players think that the best players are held to a lower standard than they are you will lose your team. 5.) Teach them to appreciate criticism and look the person that is giving to them in the eye. Players today really have a hard time being criticized. They get flustered and feel as though you are demeaning them by telling them what the can’t do or what they did wrong. I think the earlier in a player’s career that they can accept criticism the better that they will be. Some coaches that I have spoken to sometimes sidestep criticism for high level players because they feel as though they will lose them mentally or they will leave their team for another. The urban legend is that great players hate to be criticized. I’ve found most players like being told the truth. Before working for the Mavericks I worked with players like Kobe Bryant, Kevin Durant, and Rajon Rondo. All of them encouraged critiquing because they wanted to be the best at what they did. The best way to approach players is to be up front with them. I think players that can take criticism early in their career can be easily coached. Of course you have to critique them in a way that doesn’t come across too negative. I think in the right context it can make a difference with the player and help your team in the long run. Body language is so important for a player. There is nothing worse than not looking someone in the eye when they are talking to you. I know as a coach it really bothers me when a player or anyone that I am speaking to doesnt look me in the eye. It makes me assume that they arent focused in what I am telling them . Players should look their coaches in the eye or anyone for that matter. It shows that they are engaged to the conversation and enables them to capture more out of it. From the coaches side remember delivery is the most important part of critiquing a player. Deliver the message directly, but identify what the layer can and can’t take. It is all about the delivery. All players need to be coached. From the best of all-time to the worst player on the planet a player needs the guidance of a coach to maximize their talent and ability. When dealing with a great player you have to give them the guidance to learn as well as hold them accountable when needed. I think there are misconceptions about great players on two counts. First, that coaches need to over coach great players. What this means is that they coach them every possession of every game and practice. Second is to given them only the minimum amount of coaching and wait until they become a dominant player. Great players definitely need coaching. They need positive and educated influences when it comes to their coaches. The problem that comes up is that a coach feels as though they need to coach a player with a lot of talent too much and breathe down their neck all day every day. Thats is a frustrating thing to deal with as a player an will create friction between the player and coach. The player should definitely be coached , but it is important to give them some freedom when they make a mistake. Give them some time to process their mistake and give them an opportunity to play through it to see if they can self correct in the game. This is a great way to give your player confidence that they are allowed to make mistakes without being yanked. Players at all levels do want a certain amount of space especially when they are going through a slump. You need to read your player and know their tolerance level of communication especially heated confrontations. Players need to be told when they make mistakes and be held accountable. On the other side of it not doing anything to confront or hold your star player accountable is a huge mistake. I’ve seen that approach and it destroys the player. They need a certain level of guidance to know the difference between right and wrong. When they aren’t giving a good effort in games or practice they need to know that. If they aren’t executing their coach needs to tell them. You can’t expect great players to figure it out with no help at the beginning stages of their career. It is hard coaching in general, but with great players its even tougher because you have to know how much to shorten the leash which is a tricky thing. I think if you let them know that you are on them when they make mistakes to help them not repeat them they will appreciate that. But they also can’t get it their head that they run things and can do whatever they want. It is a specigic balance. 7.) They need to know a GOOD can dominate the game on one end a GREAT player dominates on both. I remember being with the Boston Celtics and watching Paul Pierce play. He had unbelievable footwork. With his combination of size, shooting, strength, and deceptive explosiveness he was one of the best young scoring forwards in the NBA. Defensively he gave an effort, but it wasn’t something that he concentrated on strongly. I think what changed him from an all-star player to a franchise player was his commitment to defense. His ability to shut down anyone at his position was a huge part in the Celtics success of their championship runs. How I always explain it to players is that Michael Jordan and Kobe Bryant were both 9 time First Team All-Defense in the NBA. That’s a pretty strong statement on 2 of the All-Time players ever to play the game and their commitment to making stops. Scoring points is an important part of the game, but to combine scoring with the ability to stop people is something special. Many players have the physical tools to be very good defenders, but lack the focus and commitment to it. It isn’t easy, but it must be something that is preached on a regular basis to your player. I don’t like dropping names while developing players, but once in a while it is good to use names like these to hammer down a point. Not every player physically is good enough to be a dominating defensive player, but they can always be a good team defender. Continue to teach them and make them buy into how important defense is. As a coach you are the most important basketball tool for your player. They need to know that they can come in to your office or call/text/email you whenever they are having an issue on or off the court. You need to meet with your player regularly when needed to be able to build emotional equity with them. This will build trust and develop a bond between you and your player. This is something that you should do with all of your players, but definitely needed when developing a great player. In your communication with them you must tell them the truth and be brutally honest. Honesty is something that all players need. Don’t shy away from confrontation as it is something that will help your players on and off the court. There are so many people involved with our game that aren’t honest with players of all levels and it really hurts the product that is produced. Communication is the key to any relationship and is the key to success. In closing there is no magic pill, drill, or inspirational quote to get a player better. You need to do most of your work off of the court and needs to be done daily. I always laugh at people who live their life by other people’s sayings and quotes and expect to be successful based on what others say or do. Every one is different. Every player is different and every coach that deals with players are different. What works for Jon Calipari or Bobby Knight won’t automatically work for you. In the end it is YOU that are in the trenches with your players not John Wooden or someone else. At the end of the day you know yourself and your players better than anyone. You are the difference between players being good and great. Don’t let players go by the waste side by not putting work in. Anyone can get on the court and put layers through great drills. The problem is there is another part to player development and it entails more than what you can read in a coaching book or view in a video. Off the court development with your players is a staple in their development as a player and person. Don’t short change them and yourself as it could help them for years to come. Please let me know if you have any requests for plays, drills, defenses, etc… Also let me know if you have any articles, plays, drills, etc…that you would like me to publish for you on the site. Anyone who knows me knows that I am a huge fan of Coach John Wooden. I have read every book I can find on him, I have studied his coaching/teaching philosophies, I receive the Wooden Wisdom emails every week, and I carry around his Pyramid of Success book in my bag that I take just about everywhere I go. I truly believe there has not been a better teacher or coach of the game of basketball at any level. With that said, you can imagine how happy I was to find this list of 99 Wisdoms from Wooden on the HoopU website compiled by Tony Alfonso. Terrific stuff! Enjoy! Much can be learned from this great man known quite simply as ‘Coach’. He was so much more than simply a basketball coach, however. He was a great leader, teacher, husband, father … an example for us all. What follows below are 99 of Coach Wooden’s quotes (one for each year of his time on earth); words to live by, if you will. 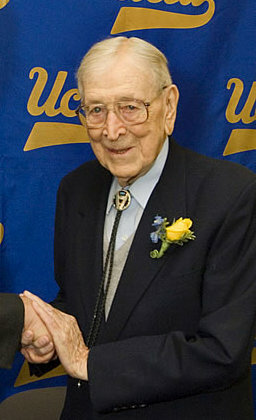 John Wooden in my opinion is the greatest coach/teacher in any sport at any level. Therefore, you have and will continue to see many of his ideas, quotes, poems, books, etc…on my blog. If you want to be a better coach, teacher, or person; the only person you need to study is Coach Wooden. He is the best and has shared his wisdom in his books, interviews, newsletters, etc…Here is the latest entry that comes from Coach Wooden. These are coaches 19 Desirable Coaching Traits. Enjoy! 1. Attentiveness to Detail: You must prepare to win in order to be a winner. Failure to prepare is preparing to fail. 2. Impartiality: This is a must, but you must remember that you must not treat everyone alike as they are all different. Give each one the treatment earned and deserved. 3. Teaching Skill: It isn’t enough that you know the game, you must be able to teach it. Follow the laws of learning. 4. Discipline: Most essential for proper concentration and group organization. 5. Affability: The coach must be of an affable disposition because of the various groups with who he must associate. 6. Forcefulness: You must be firm without being bullheaded. 7. Alertness: Constant observation of all going on around and about are necessary for improved learning and decision making. 8. Optimism: The pessimist isn’t likely to produce a confident team that will play near to their full capability. 9. Desire to Improve: Lack of ambition will result in complacency and laziness. 10. Vision: A Picture of the possible must be shown to your players to provide a goal for them. 11. Consideration for Others: You must be truly considerate of others if you expect them to be considerate of you. You must listen to them if you want them to listen to you. 12. Resourcefulness: You must be ever ready to make necessary adjustments according to the situation and the personnel that you have available. 13. Cooperativeness: An essential for all who work with others and are dependent on others in various ways. 14. Leadership: Trust be commanded, not demanded. Others are working with you, not for you. Be interested in finding the best way rather than having your own way. 15. Industriousness: There is no substitute for work. Worthwhile things should never be easy to attain. 16. Enthusiasm: If you are to stimulate others, your heart must be in your work. Enthusiasm brushes off upon those with whom you come in contact. 17. Sympathy: You must be truly interested in those under your supervision and be sympathetic with their problems. 18. Self-control: Good judgment must be exercised in your decisions and they must be made through reason not emotion. 19. Sincerity: Insincerity can be spotted very quickly and cause loss of respect. I received a few good responses on my article from earlier today titled “Competitive Greatness.” One reply discussed the effect AAU basketball has had on competitive greatness. This reply led to a really good discussion with an AAU coach. 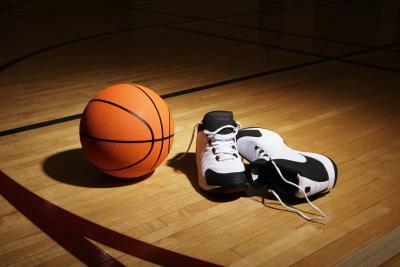 Basically, we discussed that AAU basketball tournaments have taken the focus off of winning for many of the players. Most of the players are more focused on getting recognized by college coaches than they are with playing as a team and playing good solid basketball to win games. We both agreed that AAU is an important part of basketball, but both of us would like to see more of an emphasis placed on skill development and teamwork rather than what turns into one on one battles or all-star like games. This is a topic that should be of interest to all coaches and athletes. Are you born with the attributes that it takes to be competitive and to have competitive greatness or are these skills and attributes that are learned during the course of your life? In my opinion, the answer is true competitive greatness is a learned trait that has been taught or discovered by anyone who has ever achieved greatness. To be great at anything in life including athletics, you need to have the skills, passion, and desire; however, to be truly great and achieve competitive greatness, you need more than this; you have to have that internal motivation to be your driving force. Sure you can become great utilizing external motivators, but if you can’t motivate yourself from within and that is not the true driving force that makes you tick; then I don’t believe you can ever achieve true competitive greatness. So how is competitive greatness learned or discovered? I will discuss my answer in terms of basketball and how I believe it can be taught to athletes in today’s world and I will share with you three steps in which I believe are the most important when trying to achieve competitive greatness. 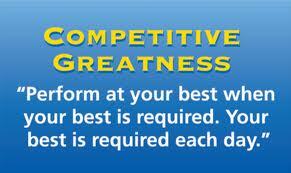 The first step towards competitive greatness comes from being competitive! Children in today’s society are taught that there are no winners and losers in sports; that just being involved makes everyone a winner. I agree to a certain point, everyone involved is a winner because they are putting a great effort into their sport; however, these children are not stupid, they know whether or not they won or if their team won, so why not just tell them! Everyone can celebrate the fact that they have participated and gave their best effort, but the earlier these children learn the importance of competition in the world, the better off they will be. As a college basketball coach, we are always looking for ways to teach and add competitive fire to our players. One of the best ways that we utilize is by making every drill and workout competitive. Not only does it make for better practices and workouts, it gives us a better look at which individuals thrive on competition. By learning which player’s thrive on competition, we gain a much clearer perspective into who our team is, what we are made of, and who should be on the floor at the biggest moments of the game. At the college level, every player should be competitive! If they made your team and don’t have a competitive fire within them, then I think you may need to re-evaluate your recruiting strategy to find players who carry this significant attribute. The second step towards competitive greatness comes in the form of internal motivation. As a coach, you need to get to know your players, get to know what makes them tick, and see what it is that truly motivates them. This is not an overnight process; you need to build a relationship with your players and then and only then can you find these answers. If a player is continuing to play the game of basketball at the collegiate level, they must of some form of internal motivation. 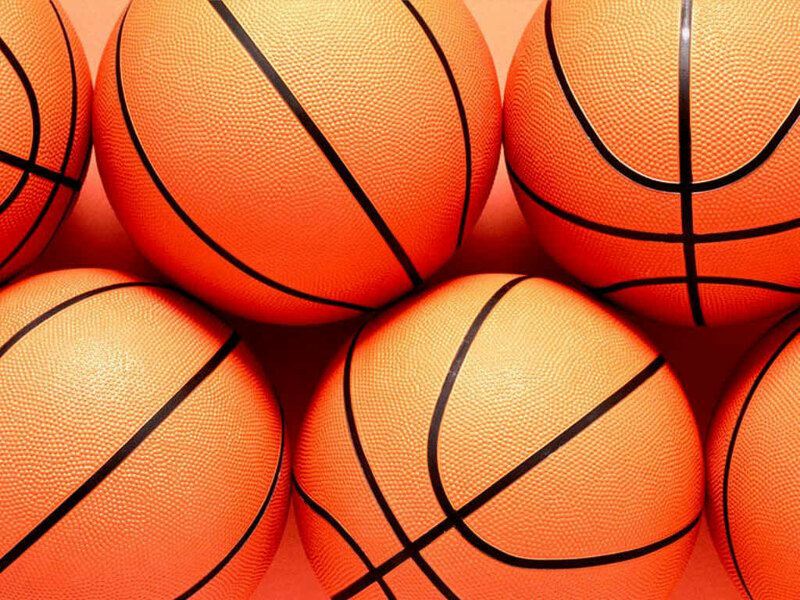 Being a college basketball player at any level is not an easy task. It takes hard work, dedication, discipline, and a full commitment from every player if your team has any chance of being successful and achieving competitive greatness. As a coach, you do not really have the ability to teach internal motivation to your players. This internal motivation likely is built in to each player at an early age. It is your job as the coach to find out what each players internal motivations are and then utilize them to pull out the best each one of your players has to offer. For instance, if you were coaching Michael Jordan, you would have known that his internal motivation was to never be outworked, to never lose, and to be the best player he could possibly be. You would have known this and anytime you saw him skipping a workout, taking it easy on a teammate in practice, allowing himself to overlook basic fundamentals; you could just walk up to him and remind him that these actions are not going to allow him to achieve his internal goals and I am sure he would have immediately taken over and dominated the rest of practice or the workout. The third and final step towards competitive greatness that I will share with you today is preparation. The definition of competitive greatness varies depending on where you look; but basically means being able to perform at your best when your best is truly needed. In order to perform at you best, you need to be prepared physically, mentally, emotionally, and spiritually. If you take care of your body, mind, and spirit and prepare them on a daily basis then you are on your way to achieving competitive greatness. As a coach, preparation is the key to your success! You need to prepare your team for every practice, workout, meeting, scouting report, and game. By having each practice and workout as competitive as possible, you are preparing your team to play at its best in crucial situations. By knowing what motivates each individual player internally, you are preparing yourself to lead them to victory. By successfully preparing for your opponent, you are giving your team the best opportunity for success. By having your players be prepared physically, mentally, emotionally, and spiritually day in and day out you are preparing your team to achieve competitive greatness! 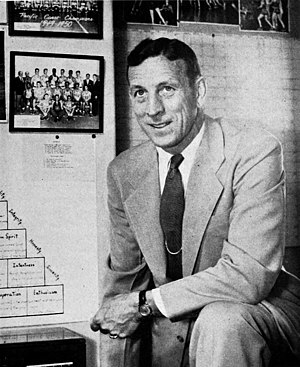 John Wooden, arguably the best coach at any level of any sport created the Pyramid of Success during his career as a basketball coach. At the top of his pyramid was competitive greatness. The reason it was at the top of his pyramid is because he truly believed that if you achieved competitive greatness; then whether you win or lose, you were successful. I couldn’t agree more with Coach Wooden. Only one team at the end of the season will be crowned champions. So does that make every other team losers? Of course not, if you and your team gave their best effort day in and day out, then you allowed yourself and your team to reach competitive greatness and had a successful season! Coaching – Book of the Week! One way that I have successfully molded my coaching philosophy has been through reading. I have a large library of books and most of them pertain to coaching, leadership, motivation, relationship building, and success. In reading these books, I have gained invaluable knowledge that has and will continue to help me in life and in my coaching career. My favorite books are biographies of successful people and coaches. I love to read these books and look directly at what these successful people have done in their lives and how they got to be successful. In doing so, I have found common traits in all of them. The most common traits I have found are a passion for life and their trade, dedication, hard work, innovation, positive attitudes, well-educated (book smarts and/or street smarts), self-motivated, and great leadership skills. 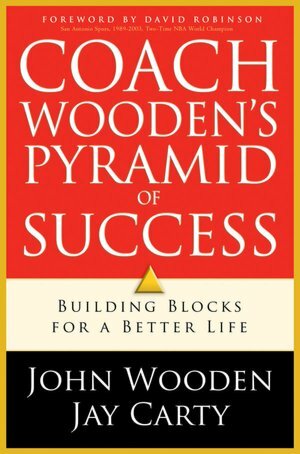 This week I will share one of my all-time favorite books: Coach John Wooden’s Pyramid of Success: Building Blocks For a Better Life. If you are a coach of any sport at any level and have not read this book, I can’t recommend it enough! 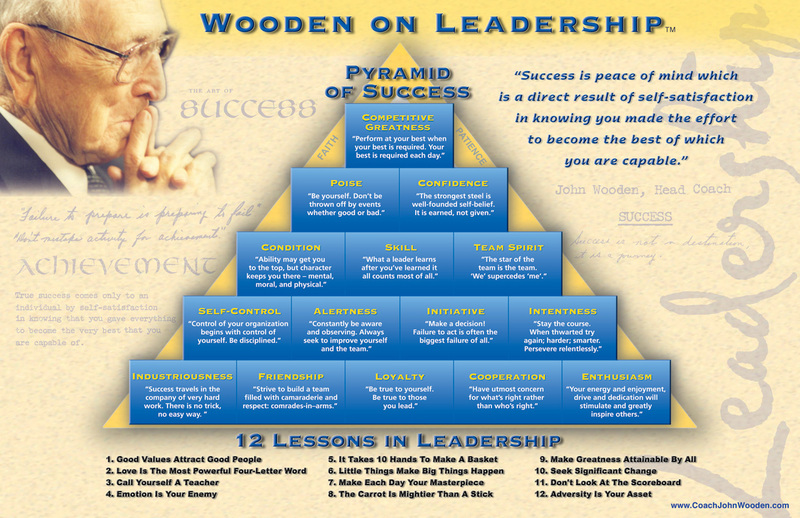 Coach Wooden’s Pyramid of Success is utilized by sports teams at all levels as well as major Fortune 500 companies and helps these teams and organizations continue to grow and become more successful.